Emaciated Fur Seal Strandings in California – Neptune 911! 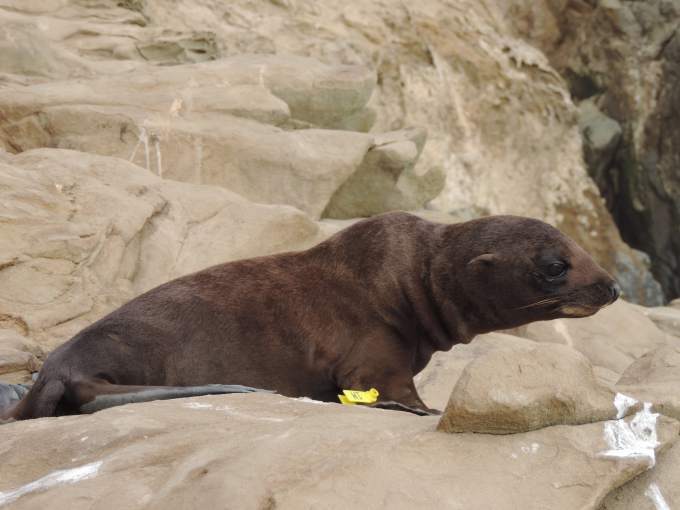 In what’s already a grim year along California’s shores for marine wildlife, concern is growing about rare fur seals that are turning up, weak and emaciated along the coastline, including the Sonoma Coast. Guadalupe fur seals, an imperiled species few in number and rarely seen anywhere close to land, have been coming ashore along the Central Coast and the Bay Area and as far north as Crescent City, well outside their normal range, marine mammal experts said. Most of the affected animals appear to have been weaned just weeks ago, experts said. About 50 or 60 strandings have been reported so far, with exact numbers unavailable this week as wildlife rescue and rehabilitation crews have scrambled to deal with the new crisis. At least three Guadalupe fur seals have been rescued from the Sonoma Coast, including two on Salmon Creek Beach and one at Doran Beach, according to records kept by the nonprofit Marine Mammal Center near Sausalito. Two or three also have been found dead on local shores, said Bodega Bay resident Phil Warren, a Marine Mammal Center board member and volunteer. Though arriving on land at a far lower rate than California sea lions — several thousand of which have been rescued or recovered along the Pacific Ocean shoreline since January — Guadalupe fur seals exist in limited numbers and are listed as threatened on the federal Endangered Species List. There are believed to be fewer than 10,000 remaining, so the impact of large-scale losses could be significant, said Moe Flannery, collection manager for the department of ornithology and mammology at the California Academy of Sciences. The stranding surge comes amid a scramble to address a variety of issues among marine mammals on the California coast, including the “unusual mortality event” that has resulted in thousands of sea lion deaths, a recent spike in beached whales on the North Coast, the oil spill off Refugio State Beach near Santa Barbara, and a toxic algal bloom affecting Monterey Bay that has led to skyrocketing levels of a deadly neurotoxin called domoic acid. The substance becomes concentrated as it moves up the food chain and already has killed numerous seal species. “We’re kind of all hands on deck for the stranding community right now,” said Justin Viezbicke, west coast stranding network coordinator for the National Marine Fisheries Service. Guadalupe fur seals were once hunted extensively because of thick, dense pelts similar to an otter’s. They were plentiful off the California coast, but by 1928 were believed to be extinct, according to the National Marine Fisheries Service and other sources. In 1954, a small number were discovered in breedings grounds on Guadalupe Island off Baja California. They have been recovering slowly since then. Little is known about their habits because of geographical isolation and their behavior. Where many types of seals and sea lions sometimes come on land to rest or warm up, Guadalupe fur seals tend to stay out in the water. Most of those in need of help now are still pups that would have been born last June and weaned after about 11 months, experts said. Where Pemberton and her co-workers would typically collect two or three dead Guadalupe fur seals in a year, they recovered 33 dead animals in April and May alone, she said. Many of those found alive are in the care of the Marine Mammal Center, the state’s largest marine mammal rehabilitation center and one of two facilities authorized to care for the imperiled animals because of their endangered species status, Viezbicke said. The most Guadalupe fur seals the hospital has seen in a given year is four, though usually it’s two or fewer, a spokeswoman said. The center currently has 14 Guadalupe fur seals and has lost 11 since mid-February. One also has been released back to the wild, though several others are about ready to go, according to Shawn Johnson, director of veterinary science for the facility. You can reach Staff Writer Mary Callahan at 521-5249 or mary.callahan@ pressdemocrat.com.